Troops fighting on the frontlines of the Boko Haram conflict in northeastern Nigeria have released a video claiming at least 100 soldiers died in a recent attack and deploring the poor state of their equipment. In the five-minute video seen by AFP on Saturday, a soldier narrating in the background shows the burnt shells of several tanks and vehicles at the Metele base, which was attacked by the IS-affiliated Islamic State West Africa Province on November 18. At least 43 soldiers were killed in the attack according to military and civilian sources, though the army disputes the death toll. The video came as it emerged Saturday that around a dozen girls had been kidnapped by suspected members of Boko Haram in border villages in southeastern Niger. It underscored growing desperation among troops, who in June protested at being redeployed to the remote Lake Chad region after fighting Boko Haram jihadists for years without relief. "No less than 100 plus soldiers died here. Many are missing in action, they are nowhere to be found," said the soldier in the video, which was obtained by AFP from a military source who confirmed its authenticity. "See the weapons they bring here. These are not working," he said as the footage revealed the charred remains of tanks and other military equipment. "These are outdated vehicles, they are not working. They just keep them here for formality," said the soldier. "Imagine, they are killing us every day," he said. "The situation is getting worse." The video shows the sprawling camp in the middle of the desert, 260 kilometres (161 miles) from the Borno state capital of Maiduguri. There was no immediate response from the army on the release of the video. More than 27 000 people are thought to have been killed in the nine-year Islamist insurgency that has triggered a humanitarian crisis and left 1.8 million people without homes. The video, the first public glimpse of the base since it was attacked, shows piles of blackened zinc sheets that were the living quarters of the troops. Personal effects and cooking pots lay scattered across the ground as soldiers move around the debris under a bright blue sky. On Monday, ISWAP said it had killed "more than 40 Nigerian soldiers" in Metele and carted away "four tanks" along with other vehicles and ammunition. 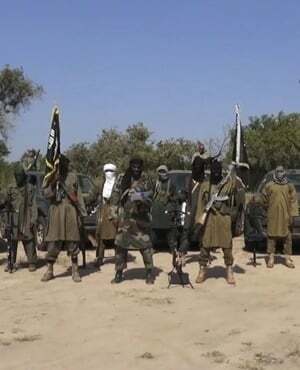 On Friday, the jihadist group claimed that its fighters killed 118 Nigerian soldiers in five attacks on military bases across the northeast in the past week. The Nigerian military broke its silence late Friday evening to confirm that the Metele base had been attacked. It said in a statement that while it is "true" there was an attack, it observed that "several social media, print and online publications have been brandishing false casualty figures." Nigeria's President Muhammadu Buhari said on Saturday in a statement that he was in "deep shock" over the Metele attack. "We are ready to give them all the needed support in terms of equipment and manpower to succeed in ending the renewed threat," said Buhari. "In the coming days, I am engaging the military and intelligence chiefs in extensive discussions on the next steps we shall be taking." Many have been claimed by the Islamic State West Africa Province (ISWAP). The attacks have been seen as a sign of a hardline takeover in the faction by more radical commanders and have stretched the army at a time when soldiers are complaining of fatigue.